The Big Divisive Question: Star Wars Or Star Trek? I was recently asked, as an assessment of my personality and temperament, "Star Wars or Star Trek?" Time was when this was a much simpler question: Star Trek was on television, Star Wars was at the movies. They were consumed in different ways, and so could simply co-exist. Now each has spawned books, comics, documentaries, films, games, television, toys, and video games (and about a million other media streams and product lines). They're pervasive enough to be recognized by society at large, but not so much that boring people still mix them up. Those people might think the question I was asked was a silly one, assuming they're too alike for one to have a preference. (I did specify that these people are boring, right? Consider it re-specified.) Star Trek and Star Wars are too different to be tied, and anyone who has a preference one way or another will bristle at their being lumped together. Why? They're both cornerstones, in their own right, of nerd culture at large. They've contributed to who we are as people, what we do with our time (and money), how we live our lives, how we're viewed by others. To that end, I think the question I was asked was a valid one. To know whether someone prefers Star Trek or Star Wars is to have some little insight into not only that person's interests, but the type of person that they are. Over the next two days, I'm going to be exploring what a declared preference says about not only the way you view and interact with the world, but the way in which the world views you back. So as to not show bias, I'm examining them in the order in which they were asked: Star Wars today, Star Trek tomorrow. Call it a space opera, call it an epic, call it The Hero with a Thousand Faces: Star Wars is all of these and more. But what does it say about you, as a nerd, to prefer Star Wars over Star Trek? Well, consider the nature of the epic poem -- Beowulf, Paradise Lost, what have you. What define these as "epic" are the internal depths they plumb. Yes, there are technical aspects which qualify something as an epic, but works so classified take their hero and tear him apart. 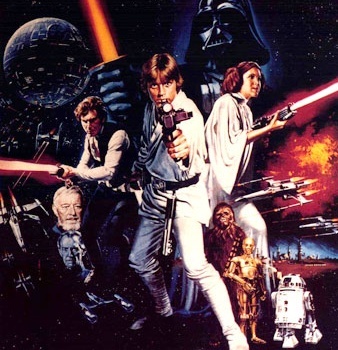 Star Wars could have simply existed as space movies -- kickass special effects, decent dialogue, neat-o aliens, and a woman running around without a bra. Instead, Lucas (who has acknowledged a debt to those epics before him) dropped us in medias res and gave us Mark Hamill. Nothing, other than his obvious position as the film's protagonist, distinguishes Luke Skywalker. Yes, he can drive his T-16 real fast, but he's just a boy, living with his aunt and uncle. We recognize him as a hero when we see he dreams of more, when his curiosity is piqued by a dusty little droid, when he lands in a situation much grander than anticipated, and holds his own. The Star Wars fan appreciates the detail, and the mythology (which we'll get to in a minute, calm down), but most of all, they love the introspective nature of the epic. There is no character in the Star Wars universe that does not examine him, her, or itself, and their place in their universe. The big revelations of the series are not the action sequences, but the personal realizations. Yes, it was awesome when the Death Star blew up, but compare that to the knowledge that Darth Vader is Luke's father, or that Luke and Leia are siblings. Han Solo is a total badass, but he's never more interesting than when he simply says, "I know." To love Star Wars is to recognize that the human story is always far more compelling than the mere physical world. This makes Wars fans introspective, self-aware, and, hopefully, compassionate. If your answer to The Big Divisive Question is Star Wars, you are likely introspective, compassionate, attentive, and detail-oriented. You probably prefer fantasy to science fiction (more princesses, swords, empires, and sidekicks, please), and your interaction with the world is always with the greater consequences in mind. You're probably an interviewer's dream, a good listener, and ultimately someone I'd like to hang out with. But am I like you? Check back tomorrow, when I'll unpackage the Star Trek fan, and let you know how, after careful deliberation, I ultimately answered The Big Divisive Question.